Evolution of sociality must involve adaptive benefits to offset costs of living with competitors, especially among potentially cannibalistic predators. I am particularly interested in the trade-offs that obligate predators make to live in social groups. For example, group members may benefit by sharing prey or evade other predators more effectively in the group, but remaining in the group may also reduce their own reproduction. Understanding the factors that influence the evolution of social behavior and how social groups function are central issues in behavioral ecology today. 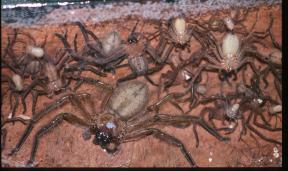 Patterns of cooperation and conflict in an extremely atypical social huntsman spider, Delena cancerides [Araneae: Sparassidae], with comparisons to closely related solitary huntsman spiders. Patterns of social communication and exploration in social whip spiders (Arachnida: Order Amblypygi).